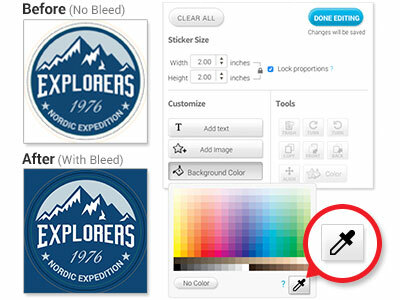 When you select any sticker shape in either of our Sticker Editors, we automatically add 0.125" of padding space around the design of your sticker to ensure that everything you wanted is printed without getting cut off in the production process. If you choose Removable Clear Vinyl as your material, your border will be transparent so it would not affect your design , however, if you select Removable White Vinyl material you will see a thin white border around your image once you apply the sticker. If you don't want this white border, you can add a background color of your choice to fill the space around your design; if none of the colors provided in the Background Color palette are suitable, you can select an exact color from your image directly with the Eyedropper button. The Eyedropper button can be found inside the "Background Color" palette in the lower right corner.